This National Trail follows the northern escarpment of the chalk Downs from where there are extensive views across the Weald to the north and over the rounded hills and dry valleys to the sea in the south. There are several steep ascents when crossing the valleys of the Rivers Cuckmere at Alfriston, Ouse at Southease, Adur south of Bramber and Arun at Amberley. It visits Jevington and passes Iron Age hillforts and barrows. 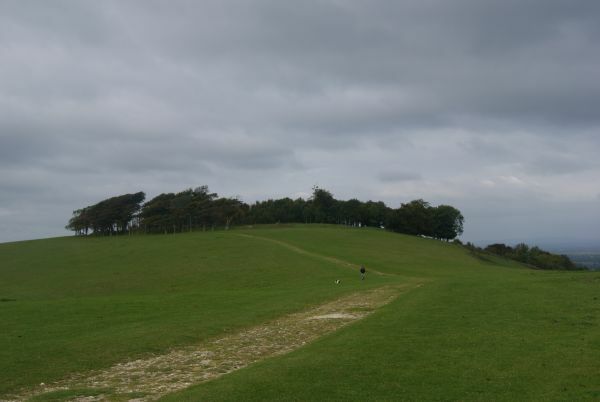 Between Eastbourne and Alfristion there is a coastal alternative to the inland route, running along the scenic cliff tops to Beachy Head and the Seven Sisters (pictured) and turning inland at Cuckmere Haven along the Cuckmere Valley to rejoin the inland Way route at Alfriston. Here there is a connection to the 1066 Country Walk that leads in turn to the Saxon Shore Way - see E-Routes (E9). The Jubilee Way (East Sussex) (12 miles circular route) used some of the South Downs Way at Eastbourne and that part of it not on the South Downs Way is waymarked with a crown symbol. A publication is no longer available for it.